Softer than-love döner kebab. Grilled eggplant tossed in a garlicky yogurt sauce. Tomatoes crushed with hot red chillies and walnuts. Turkish cuisine deserves every morsel of its culinary fame, thanks in large part to its strategic location nudging Asia, Europe and the Arab world. Over the centuries, influences from across the continents have mingled to create the delicious melting pot that’s bubbled its way into our hearts. If you’re going to Istanbul, bring back the spices that give their food its incredible flavour. In Turkey, Biber (pepper) is king. Name any kind of pepper—sweet, hot, red, black, yellow or green, and the spice market is sure to have it. Each one has its specific heat and flavour, and your best guide to buying the right one for your kitchen would be a Turkish local or the shopkeeper himself. These dried red pepper flakes are a mainstay of Turkish cuisine. You’ll find them beside the salt in most Turkish restaurants. It comes in varying degrees of spiciness, so check with the merchant before you buy. Look out for isot biber – a smoky variety from Urfa in southeastern Turkey. Sprinkle it into stews, or over grilled meat. Spices used to make Kofte (meatball) can be used for many other meat dishes. The main kofte spices are; cumin, coriander and chilli. This mixture works wonders with most meat dishes. The other spices that are used in making kofte are black pepper, fenugreek and cloves. Sumak is a decorative flower ornamented with very astringent leaves. The red berries of the flower are harvested and then dried. Its flavour is slightly vinegary and can replace a dash of lemon in a recipe. Grown in Turkey, this distinctive variety of thyme gives flavour to grilled meats or vegetables of any kind. Add it to lentil stews, beans ad chickpea soup. A Turkish version of our garam masala, composed of black pepper, cardamom, cloves, cumin, nutmeg, coriander and paprika – plus mint and cinnamon. They use it to season everything from fish to lamb, beef and chicken with rice. 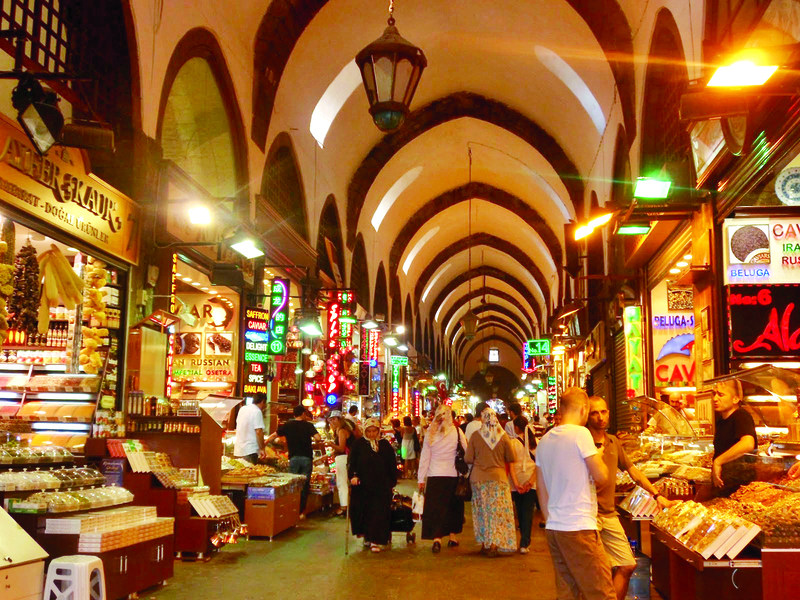 • Built across 6,000 square metres, it’s the city’s second largest marketplace after Grand Bazaar. • The Spice bazaar was built in the 1660s as an adjunct to the New Mosque. Sales from the spices funded the construction of the mosque. • The Bazaar is built in an L shape. It has nearly 90 shops and six entryways. • It is also called the Egyptian Bazaar, because it was built with tax money collected from Cairo during the Ottoman Empire. • There’s much more than spices to be bought here—check out the mounds of medicinal herbs on sale. (Psst: Turkish viagra is a hotseller).